A technological masterpiece: Witness some of the most advanced programming in gaming history, pushing the limitations of consoles and raising the standards of games in all areas of production: physics, lighting, graphics, animations, and more! An unmatched hero: Wielding powers of mythic proportions, the Prince returns to action-adventure gaming with gravity-defying acrobatics, ferocious fighting skills, and the ability to bend time to fulfill his destiny. The Sands of Time: A technological breakthrough that will change the face of action-adventure gaming forever. Erase the past, behold the future, and freeze the present in real-time for unlimited gameplay. Exotic worlds and vast kingdoms: Uncover the mysteries of a world never before explored in action-adventure gaming. © 2003 Ubisoft Entertainment. Based on Prince of Persia® created by Jordan Mechner. All Rights Reserved. Ubisoft, the Ubisoft logo, Kudosoft, and the Kudosoft logo are trademarks of Ubisoft Entertainment in the U.S. and/or other countries. 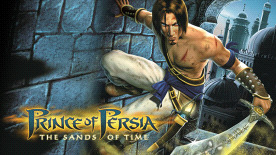 Prince of Persia is a trademark of Jordan Mechner used under license by Ubisoft Entertainment.